I like to call this bay just outside of Genoa, a casket of jewels. 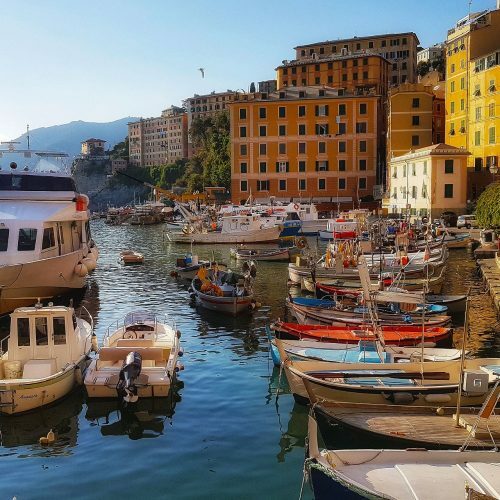 The best place where you can enjoy this paradise is from the walk of lovers, “Anita Garibaldi” (La passeggiata degli Innamorati Anita Garibaldi) in the little village of Nervi. In winter or hot summer days, noon or evening, during the stillness of the sea or storm surges, this walk offers at me always different emotions! The walk is obtained on the cliff and when I need to relax this is the ideal place: every time I am so surprised as just outside the city there is a place so enchanting and unique. Personally, I love to go there in the evening after a hard day at work this is what I need. I like being able to sit and enjoy a drink in small premises, which were once home to fishermen. Sometimes at nights, among the rocks there are fishing boats but also people playing polo. From the walk you can go to lie down on the cliff, how many times when a was young, after the lessons at school I took the bus and went there just to lie down on those rocks to study or read a book. The village called Nervi, is characteristic, it is nestled between sea and mountains. There are times that I like to wander through its narrow streets between painters shop and fashion shops, and admire the villas of the parks. Among the marvelous villages that are in this bay, I want to tell you about Camogli and Portofino. When I think about Camogli, what immediately comes to my mind is a corner in particular, a little hill where is a maritime pine that stands out over everyone and that reflects itself in the majestic sea Walking among the colorful houses of this coastal village, there are painters who exhibit their works, local shops, restaurants that cook fresh fish and lots of focaccia shop (In the winter weekends there are so many ligurians that come here just to walk). The Cathedral on the sea and the Dragon Castle built in 1100 on the rock are very particular. This village had also an incredible fleet of sailboats in the past, came to have 700 sailing ships and that is why the town was nicknamed “The City of Thousand White Sailing Ships” (“La città dei mille velieri bianchi”). The second Sunday of May, Camogli is invaded by people from every part of the Italy and the world to attend the Fish Festival in honor of St. Fruttuoso, patron of fishermen. The festival symbol is the giant pan in which is fried the fish! I meet my friends in Genoa and from there we take the ferry and go to taste the fish. The feast of Christ of the Abyss in July is suggestive, a procession of divers who place a crown at the foot of the statue in the bay of San Fruttuoso di Camogli. This village is a pearl, and the only way to get there is just across the sea or walking through the paths. Arriving by ferry you will be fascinated by the many monuments there are in such a small bay: there is an Abbey (1000 a.d.), a church and a tower, their stories are beautiful and ancient, among these monuments can be seen even the houses of fishermen. Portofino: the first thing that comes to my mind is, that this village is a chic destination. Many movies have been filmed here, a small bay with many colorful houses, fashion shops, restaurants, the two churches at either end of the bay, the square, the numerous Yacths moored. Portofino is beautiful also for its nature, an emerald green sea and the many paths from which you can see breathtaking landscapes!